The Ceramica Del Conca company, like the Italian men’s World Cup team, does everything just so. Disembarking their flight wearing perfectly tailored Dolce & Gabbana suits before changing into their kit and running circles around England, Italy proved once again that perfection is well within reach of those who give attention to every detail. 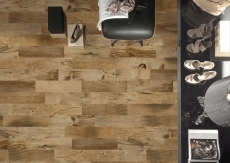 From the shopping streets of Milano to the impeccable centuries-old architecture around every cobbled corner, paying attention to small things really pays off in the end – and the same is very true for tiles. 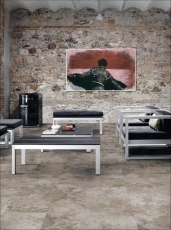 The Ceramica Del Conca company have continued this Italian legacy with their ceramic floor and wall tiles. They were the first Italian company to invest in new porcelain technology and have since quickly become industrial leaders in this emerging technology. 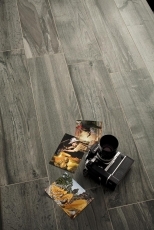 With their HNT Through Body Porcelain series and their equally alluring HTA porcelain series they have created an elegant, muted porcelain tile with the mouth-watering look of fragile and expensive Italian quarry marble, but without the hassle or the cost. Just because we live in the shiny new cities of the USA doesn’t mean we can’t enjoy the luxe life of the Italian stallions. When it comes to good taste, as a general rule you can fake it ‘til you make it or just defer to Italian style – they’ve got good looks down to a semi-science and with all our megabox shops and pre-fab homes we’ve got centuries to go before we can even come close to catching up on our own Americana merit. But please feel no shame in suckling off of Italy’s teats – because there is no shame in tasting the cream of the crop and all your friends will be super jealous. We never said you needed to tell them where you got your inspiration – since Del Conca even has an American branch now.